German company Multivac said it will unveil integrated packaging solutions from a single source at the 2017 interpack, to be held in May, in Düsseldorf, Germany. The solution portfolio includes all types of automation tasks and levels of integration. The processes for infeed, marking, quality inspection as well as cartoning and palletisation are also integrated in fully-automated solutions, apart from packaging. The company plans to display a complete line for sliced goods packaging at interpack. One of the machines will be the R 235 thermoforming packaging machine, which the company claims to have designed for packaging flat packs of sliced products. The machine can undergo quick-changes in sealing dies and forming will convert it to perform tasks of other pack formats. The R 235 can also be integrated with several labelling and marking systems. The machine can also be equipped with a jumbo film unwind for lower webs to reduce machine downtime. Additionally, the R 235 is equipped with a slicer interface. The loading conveyer of the slicer can be placed horizontally at the film’s height. This saves on additional transport conveyors and space. For the loading of packs with sliced goods, two different loading systems are showcased on the line, the MULTIVAC Horizontal Loader as well as a MULTIVAC Pick-and-Place system. Both systems are designed to insert sliced products into packs safely and hygienically with a high cycle output. Packs of sliced products are labelled by the L 330 conveyor belt labeller. The line is equipped with the H 130 handling module for cartoning. 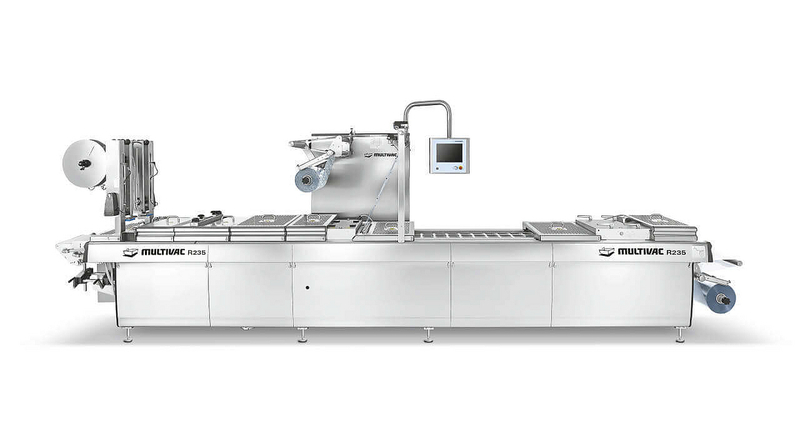 Image: Multivac to showcase thermoforming packaging machine at interpack. Photo: Courtesy of Multivac.